The Philadelphia Eagles’ winning streak came to an abrupt end against the Chicago Bears, in a huge loss to Chicago. The Bears simply outmatched the Eagles and dominated the entire game, especially on the defensive side of the ball. The Bears were able to win the game at home, 26-31. I am incredibly disappointed in how the Eagles performed this Sunday against the Bears. When you stack up the two teams, the Eagles should have been able to win this game and keep a hold on first place in the NFC East. Now, the Eagles slip to (7-4) and are once again tied with the New York Giants in an all-out fight for a playoff spot. The Bears are now leading the NFC North (8-3) after their home win against the Eagles. They were able to take the lead after the Packers lost to the Falcons on the road. This is a huge win for the Bears as they make another huge push for the playoffs. Matt Forte showed up the Eagles rushing defense. Big time. This entire season the Eagles did not allow a running back to rush for more than 100 yards. The Eagles have been matched against some of the best running backs in the NFL: Frank Gore, Chris Johnson and Maurice Jones-Drew. Forte was able to burn the Eagles defense for 117 yards. He averaged 8.4 yards per carry. I did not think that Forte would be an issue for this solid Eagles rushing defense, but obviously I severely underestimated him. Forte was able to run all over the Eagles defense, even when his blocking was non-exsistent. Forte was also able to make an impact in the passing game, catching two passes for 22 yards. Both of these catches were on third down, and he was able to get enough yardage to convert both of them. The threat of Forte opened up huge passing lanes for Jay Cutler, who was able to finish the game with four passing touchdowns. Forte did a great job of keeping the Eagles defense off balance and capitalized off of mistakes. This was a great performance from Forte. If only I was a Bears fan, I would be appreciating this much more. I laughed. I responded with, “Vick hasn’t thrown one all season. So I wouldn’t get your hopes up.” I thought that Michael Vick would be able to keep his no-interception streak alive. I was wrong. Vick threw his first interception to Chris Harris in the end zone, at the worst possible time. Following that interception the Eagles lost all of their momentum and began to falter against the aggressive Bears team. Despite Vick’s first turnover, the Eagles passing offense was for the most part effective. I was really surprised to see that Vick was able to throw for 333 yards and two touchdowns. So, this loss should definitely not be put on Vick’s shoulders. Vick did a great job of spreading the ball around and finding the open receiver, throwing to a total of eight receivers during the game. Jason Avant led the Eagles in receiving with eight receptions and 83 yards, and a nice handful of third-down catches. I think that Eagles fans may have set the bar too high for Vick, and they just can’t expect him to win games by himself. Trust me—I would love to see him do it himself. Especially after the Eagles’ defensive performance. Did I mention that Vick fumbled the ball four times? Luckily, the Eagles recovered all of them. We should be worried about the Eagles offensive line. Once again, I was surprised to see how well the Bears defense responded to the Eagles offense. This time it was the running game that was getting shut down. The Bears defense did a killer job at containing McCoy and holding him to short runs and losses. I have not lost any faith in McCoy as a starter, but I have gained a lot of respect for the Bears rushing defense. Considering I did not think that they would be able to contain McCoy, all Bears fans have free game to call me out. However, not all the blame should be placed on McCoy. The Eagles offensive line did not do a great job giving McCoy any running lanes. I would love to think that if McCoy was able to pick up any blocks during the game, he may have been able to race into the end zone on a few missed tackles. McCoy finished the game with 53 rushing yards and no touchdowns. The stat that made me a little sick: Vick had 44 rushing yards on nine attempts. McCoy had 10 attempts. Ouch. Blame Andy Reid? That’s not even his fault. As I stated in my honorable mention, Matt Forte was able to walk all over the Eagles rushing defense. This was one of the games where I think that the Eagles should have just cleaned house at the linebacker position, and find entirely new players. Every team’s defense has a bad game from time to time. Unfortunately, the Eagles rushing defense just had a terrible game. I would have expected much more from a unit that has not given up 100 yards on the ground the entire season. To make it even worse, Forte has not had a very good season and was not expected to even be a factor in the game. The Eagles defense just could not seem to get Forte on the ground. It seemed like every single time that Forte would take the handoff he would break two tackles before finally being brought to the ground. This is not like the Eagles defense, and they were just dominated. I eat my words—again. Please Bears fans, call me out a second time. Just a disappointing performance from the Eagles rushing defense in all aspects of their game. Maybe we could just blame Sean McDermott? Nope. He wasn’t the one tackling Forte. Have you never seen an “F-plus”? But I think that the Eagles passing defense earns the “F-plus'” due to their effort and not their actual performance. Although they gave up four passing touchdowns and 247 yards to Jay Cutler, they showed some signs of a decent effort. In any other situation, I would have been furious about the Eagles passing defense. But both of the Eagles starting corners were not playing and it fell back to a set of backups. Patterson has shown some great plays as a starter and I thought that he was a better choice than Ellis Hobbs. There was no support over the middle of the field, and Cutler was able to find receivers open all game and found the big play consistently. I don’t think that I have been that frustrated with the Eagles secondary in quite a few years. Like I said, every single team in the NFL is going to have a bad game. It just seemed like the Eagles defense could not get into a groove and were just getting walked on all game. The combination of Forte and Cutler was just too much for the Eagles defense to handle. It showed in this game how important Asante Samuel is to the Eagles secondary. Without him, the Eagles defense just isn’t the same. The Eagles defense was unable to get a single turnover the entire game. Obviously this is Samuel’s role in the defense. I called out Cutler big-time, and he showed up the Eagles all game. So if you must, call me out again. I was impressed by Cutler and he proved that he is a quality QB and that defenses must respect him, including the Eagles. This was a tough grade to decide on. As usual, Akers was automatic and hit every single one of his field goals, going 4/4 on the day and scoring 12 of the Eagles’ points. I’m glad the Eagles have such a consistent and automatic kicker, but I would love to see some more touchdowns and not field goals. 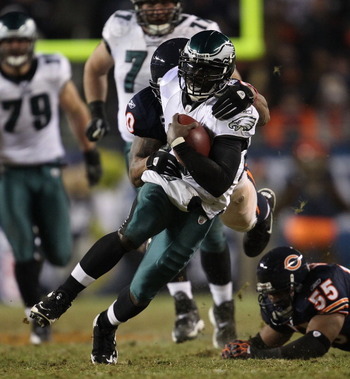 The problem for the Eagles special teams was trying to cover Bears return man Devin Hester. It is never an easy task to cover a return man as quick and as elusive as Hester is, but the Eagles just did a poor job. It seemed like the Bears were able to start every single one of their drives at the 40, following the kick and punt returns by Hester. Bobby April may be doing his best, but I just don’t think that it is good enough. The Eagles have struggled this entire season with covering kicks and punts, and Hester made that even more clear throughout this entire game. However, the Bears’ other returner, Danieal Manning, had an admirable performance as well. He was able to burn the Eagles coverage when he was given the opportunity. This could be a rough season if the Eagles continue to struggle with covering punt and kick returns. Another game goes by and once again Andy Reid shows terrible clock management skills. This is arguably one of the worst games for Reid and his clock management struggles. The most notable incident in this game was the calling of a timeout on a third-and-long play to avoid the delay-of-game call. This play was in the second half, and Reid ended up running the ball and electing to punt. This was a waste of a timeout that was much-needed towards the end of the game. Sean McDermott was unable to stop the Bears offense and continually allowed the big play, which usually resulted in points. Not to mention, the Eagles defense failed to get one turnover against one of the most turnover-prone QBs in the entire NFL. Marty Mornhinweg called somewhat repetitive plays and allowed the Eagles offense to struggle on third-down conversions, finishing a weak 4-for-13 on third downs. Mornhinweg could not seem to get DeSean Jackson involved, only getting the ball to him twice the entire game. The Eagles also had trouble getting the ball into the end zone, for the second straight week now. Not an impressive showing from the explosive Eagles offense. The 26-31 score does not indicate how this game was played out. The Eagles were able to muster together three late fourth-quarter drives to make it a game again, but don’t be fooled by the close score. The Eagles were outmatched and did not show up to win against the Bears. Call it being unprepared or over-confident, but the Eagles left that game as a defeated team. I love the Eagles. But they just did not play to win in this game. I have seen this type of play from the Eagles in the past—especially in the McNabb era, and it can lead to a slump. A slump is not something that the Eagles can afford in a close NFC East race with the Giants. The Eagles are going to look to rebound next week against the Houston Texans at home. The Texans will be without Andre Johnson, which should give the Eagles a significant advantage and may lead to a huge break for the Eagles broken secondary. This was a painful game to watch as an Eagles fan. I still am having a hard time wrapping my head around the fact that Jay Cutler had four touchdowns against the Eagles defense. But, luckily, it is only one game in a long season. I guess putting pressure on Vick and keeping him in the pocket is the key, as when he can’t get outside, he’s clearly not the same QB. I agree. Vick has shown some serious trouble when he is under pressure. That may be the fact that he still does not know his hot reads that well. Or that really is his weakness. I’m hoping that it is the latter and Vick just has not had enough time with this offense to get his hot reads down. I would think the hot read would just be DeSean Jackson every single play.. But that is not realistic. The Eagles have way to many good receivers for Vick not to be able to find the open receiver. Let’s see how he does against Mario Williams. Personally I know it’s taking a risk for him to get hurt, but I would like to see the team give Vick more of an opportunity to run with some designed runs on downs 1 and 2. No doubt. Reid is just to conservative. Especially after that rib injury earlier in the season. I’m pretty sure that Reid has lost all faith in Kolb and Vick is his savior. The last thing Reid wants is to see Vick injured from a draw play.